I am, unfortunately, using Windows 7 and am running GNU Emacs 25.3.1 (x86_64-w64-mingw32) of 2017-09-26. Everything functions as expected from the command line. However, within Emacs, I encounter a problem. wait, why is it printing to screen? and why does pressing return only insert a new line? I can't seem to get out of this! I'm not sure what to do next in fixing this. If so, might it be a problem with python.el and a bug report need to be submitted? And where would that bug be reported? This is because getpass uses msvcrt.putwch and msvcrt.getwch which only work in a cmd.exe console. IMO, this is a bug in the Python libraries, they should be using the fallback_getpass when os.isatty(0) is false. On Linux, it works just like input() (terminates with RET, input is visible). 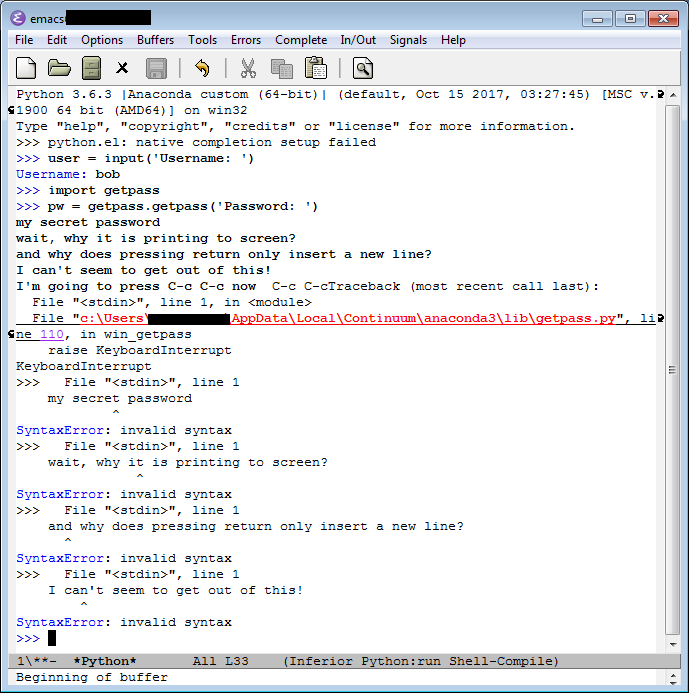 getpass relies on setting the terminal correctly, and inferior python mode isn't a standard terminal. For example, if you do M-x term RET python RET, you get python running in an actual terminal and it works. If you run python from eshell or shell (also not real terminals) it actually asks for a password in the minibuffer, but only if you have the standard prompt of "Password: ", which gives a hint that those modes are looking for "Password: " and treating it specially. The trick is to add a filter for that, and fortunately it's all implemented already. How get python major version without any additional package?